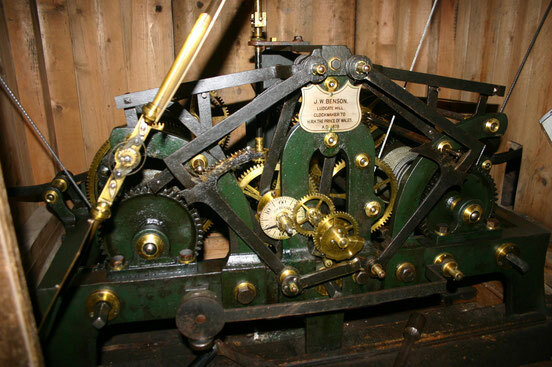 The clock was made by J. W. Benson, Clockmaker of Ludgate Hill, London. It was given to the church by Charlotte Clark, widow of Samuel Echalaz Clark of Redlap, and was inaugurated with a dedication service on 30th October 1878. It is well made, with a Graham escapement and a pendulum beat of 1½ seconds. It has a ratchet strike and strikes the hours on the tenor bell and ‘ting-tang’ quarters on the second and fourth bells. The clock is driven by three weights, the smallest being the ‘going weight’ which drives the timekeeping part of the mechanism and the hands. The next heaviest is the ‘hour weight’ which operates the hammer to strike the hours. The heaviest of the three is the ‘quarters weight’ which operates the two ‘ting-tang’ hammers every quarter of an hour. Until 2016 the clock was wound manually on Sundays and Wednesdays. However there are sixty three steps to climb to the clock chamber, and the winding itself took about ten minutes. and was reasonably hard work for the aging volunteers who undertook it. Repairs were needed to a girder which supports the heavy weights, and to the pulleys of the weight lines. It was also necessary temporarily to remove the clock mechanism in order to clear a path for the removal of the bells. In view of all this, the scheme to rehang the bells included the conversion of the clock to electric auto-winding. That avoided the cost of replacing the corroded girder supporting the weights and repairing the weight line pulleys, and overcame the need to find volunteers in the future to carry out the manual winding. The work to renovate the clock in 2016 and convert it to electric auto-winding was paid for by the Friends of St Peters.